WE’VE PULLED OUT ALL THE STOPS. BRAKE SERVICING FROM £109*. 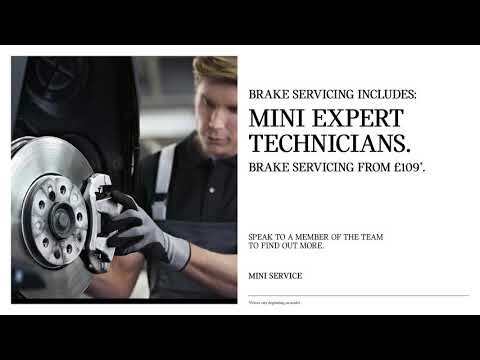 If your MINI requires new brake pads or discs, you'll be pleased to hear that we now have reduced our prices on brake servicing. This essential service ensures your MINI continues to provide the smooth, comfortable and safe ride that you've come to expect. What's more, all work is carried out by expert MINI Technicians, using only genuine MINI parts. At selected Marshall MINI Centres*, we also offer 0% finance over a 6 or 12 month period on repairs over £250, providing you with manageable monthly payments so that your vehicle can be back where it belongs, on the road, as soon as possible. SIMPLY USE THE BUTTONS BELOW TO CONTACT US FOR A QUOTE OR TO BOOK ONLINE. *Prices vary depending on model. Contact us for a personalised quote for your vehicle.